Venus got its name from Aphrodite,Goddess of love. Venus is bright and beautiful so people started to call it Venus. Venus doesn't have any moons. Compared to Earth's year.A year on Venus 0.62 longer than a year Earth .Venus has brightness of 4.6, bright enough to cast shadows. 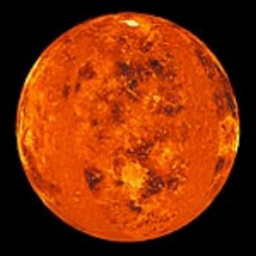 The temperature on [Venus can be more than 460 °C] , and this of course affect its weather. A planet's day is the time that takes the planet to rotate or spin once on its axis. Venus rotates much more slowly than Earth does, so a day on Venus is much longer than a day on Earth. 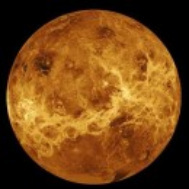 A day on Venus lasts for 243 Earth days or 5,832 hours! A day on Earth is 23.943 hours. Venus rotates backwards compared to the Earth and most of the other planets. The air on Venus is the kind of air that humans cannot breathe because there is no oxygen mixed into the air. The average temperature of Venus at night is as Summer as the day time temperature ( 460 degrees Celsius ) , this is because of the dense Venus atmosphere , Venus is covered by thick clouds that prevent heat from escaping into space . Venus is truly a runaway greenhouse Planet.